Keep yourself original and distinct from a crowd of the same with freshly designed Irish linen outfits from Royal Prestige. Royal prestige designs these casual sets out of Irish linen which is so finely combed it feels like cotton. 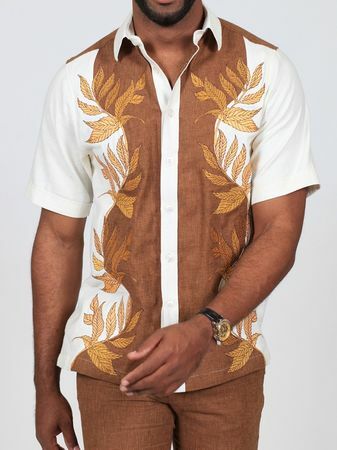 This cream and brown leaf pattern outfit features an embroidered and color block pattern shirt and solid flat front linen pants. Made of fine Irish Linen.